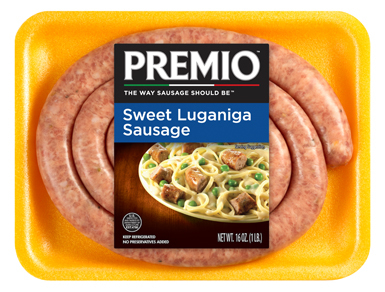 If you’re looking for a mild yet savory taste that only fennel paired with sausage can deliver, you should order Premio Sweet Luganiga Sausage. Our proprietary blend of ingredients offers flavors that stand out on their own and act as the perfect complement to your favorite meals. Whether you’re on the hunt for that “missing something” for your specialty dish or in need of the perfect protein for a one-ingredient sandwich, this sausage is it. Ingredients: Pork, Less than 2% of the following: Water, Sugar, Salt, Spices (including fennel & black pepper), Potassium Chloride, Paprika, Natural Flavors. Stuffed in Sheep Casings. Pre-heat grill. Place sausage on grill over medium flame for 12-15 minutes. Use tongs to turn sausage often until golden brown. Serve and enjoy! Place sausage on broiler rack at least 7-9 inches below heating element and broil until golden brown (about 5-6 minutes each side). Serve and enjoy! Heat a pan to a medium temperature. Add 3 tablespoons water and place sausage in pan. Cover the pan, continue heating for 5-6 minutes, turning the sausage often. Remove cover and continue cooking for 7-9 minutes or until golden brown. Serve and enjoy! Cover the sausage or place in a closed container. Refrigerate and serve within 2-3 days. Heat sausage approximately 1 minute on high or until warmed to your satisfaction (adjust time according to your microwave). Medium temperature in a covered pan for 5-7 minutes. Why choose Premio Sweet Luganiga Sausage over our many other fine sausage products? The Premio Fresh Sweet Luganiga (sausage in English) contains fennel, which leaves you with a milder yet still savory taste that everyone will appreciate. Some prefer the milder taste of the luganiga sausage all the time, while others enjoy it for a change of pace from a spicier sausage. Traditional Italian flavor with real imported fennel — no wonder they buy it by the meter in Italy! So now that you know what this sweet sausage with fennel is all about, where exactly does it come from? While we can’t say definitively, the Italian people have some ideas. As one might expect, the theories people have on the origins of luganiga are often based on where they come from. Those from the south of Italy will often say that luganiga comes from the southern region of Basilicata, a region that was called Lucania during the Roman Empire. Those from the north may insist it comes from the northern Lombardy region. The Lombardy version is probably the best-known and is what our sweet luganiga with fennel resembles. The town of Monza is most famous for their luganiga, where they prepare it with fennel and garlic. The Basilicata region also makes a luganiga, most famously in the town of Latronico, where they may make a version with fennel or a spicier version with red pepper flakes. And what about fennel, this delightful, crunchy, sweet, white herb with green stalks that you probably pass by every time you go to the grocery store — unless you’re an Italian cook? In addition to making our sweet luganiga sausage taste delicious, it’s one of the healthiest things you can put in your body. Fennel is loaded with flavonoids, powerful antioxidants that can reduce inflammation and may help prevent cancer. On top of that, fennel is rich in Vitamin C, another crucial antioxidant that one needs in order for your immune system to function properly. If you’re concerned because you’re not drinking enough orange juice, eat more fennel! Fennel has a rich and storied history and, in fact, the famous Greek Battle of Marathon took place on a field covered with fennel plants. Legend had it the Greek Gods delivered knowledge to man in a fennel stalk filled with coal. Of course, none of that will matter when you bite into a Premio Sweet Luganiga Sausage with Fennel. You’ll just know that it’s delicious!Use our store locator to find where our sweet Luganiga sausage is sold near you! Make exciting recipes with our Premio Fresh Sweet Luganiga, such as our prize-winner’s Grilled Premio Sausage or a Shrimp Sausage Po’ Boy sandwich, which is perfect for those lunchtime hunger pains! For a hearty dinner, try the Harvest Luganiga Sausage and Acorn Squash Bake, guaranteed to please!